Jill Of All Trades: #ShareTheLoad with Ariel's #WashBucketChallenge. A couple of months back, Ariel and Blogadda asked us bloggers to blog about #IsLaundryOnlyAWomansJob. In the second phase of this campaign, they sent a packet of Ariel Matic to challenge the men to do the laundry. So on Sunday, a convenient day when my dad and brother were home, me and my mom got them to do the laundry. They had been quite positive and willing, saying that it's just pressing a few buttons and adding detergent, any one can do it. When they actually got the dirty clothes, ariel matic and stood in the store room facing the washing machine, they were clueless. As my brother Chirag quotes, "I am totally blank, there are so many buttons here! I thought it was just Start - Stop - Pause!" You should have seen the smug look on my mom's face, after all, she's the one who does the laundry daily and was more than thrilled to see them take this challenge up. Then my brother realized that it is not as easy also, you need to segregate coloured clothes and white clothes, amount of water and detergent powder has to be judged according to number of clothes, in all he found it very tedious. As a result, a sudden profound respect for all the work females do. He used to take mom for granted and would yell if his favourite tshirt or best fitted pair of jeans were not washed and ready for him to wear when he wanted. Now, coming to my dad, he found it easy once he was instructed what was to be done. He was glad that he finally learned how to do laundry, and is now confident to do it if the need comes. He told us how things have changed, a decade or two ago society would laugh if they knew the men in the house wash clothes, but today with the facilities, change in thought and gender equality making tea, making their own bed, drying their towel, finding socks and handkerchiefs from the cupboard; men are expected to all of this. So then why not laundry? But he also mentioned that since the women in our house (joint family) are all housewives, this task comes on them. But yes, if they were to start working, the house chores would definitely be shared between both equally. As he said "If females share outside work, we're more than happy to share home work." P.S. Apologize for the bad images, but our machine is placed at such a spot in the store room that the light comes from opposite direction, and even flash did not help. 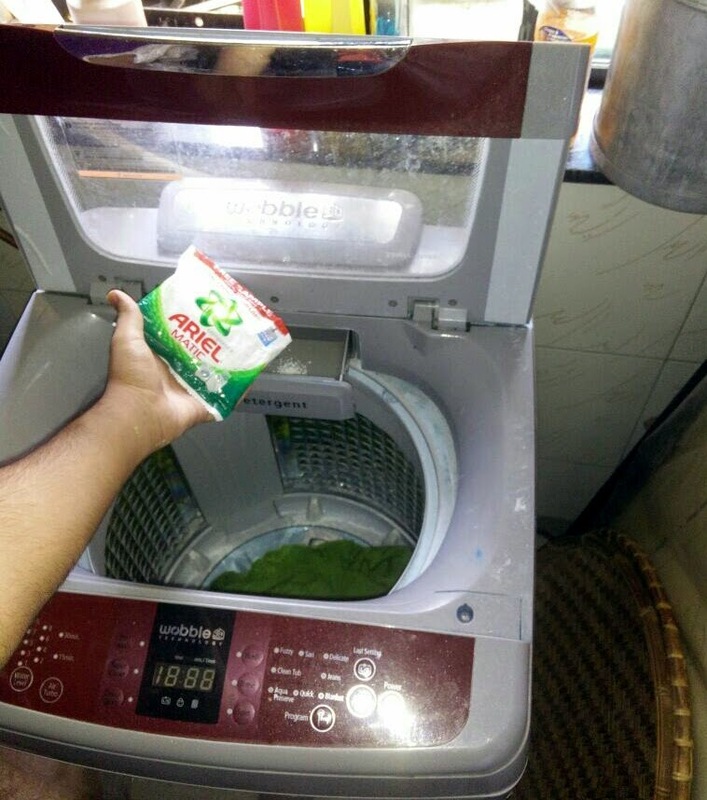 Disclaimer: This post is a part of the #WashBucketChallenge activity at BlogAdda.com is association with Ariel India.